1. Know what you want to be known for. Choose one or two strengths and focus on establishing your identity consistently across all of your profiles/bios. 2. Tweet. Network with people who are doing your work and boost your visibility through popular hashtags and chats. 3. Admin groups. Become an administrator of online or face-to-face groups about your topic of interest. 4. Champion a resource or product. Contact the company behind a tool you love and pitch the idea of getting paid to present at a conference. 5. Present at speaking events and in online forums. 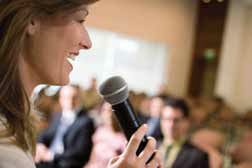 Audiences of these conferences might even invite you to speak at their events. 6. Comment. Share your thoughts and feedback on articles and popular blogs, with a link back to your own online space. Establishing your presence helps increase your credibility. 7. Publish. Find outlets and offer to write articles for them. 8. Start a blog. Maintaining a blog helps you build a following. Provide useful content that you can update regularly. Be patient: it usually takes a few years to build a strong following. 9. Write a book. Seek a book deal and remember that this can lead to speaking engagements and book tours.